Nestled in the Sierra foothills of Oakhurst, CA, less than thirty minutes from Yosemite Park, resides an unsuspecting property that could be something right out of a fairytale. The Estates by the Elderberries is a compilation of a first class restaurant, Erna’s Elderberry House Restaurant; a luxury 10-room hotel, Chateau du Sureau; a private villa, Villa Sureau along with the most recent addition of Spa du Sureau. This enchanting nine-acre property, is the creative vision of Erna Kubin-Clanin. Originally from Austria, Erna has a bit of a fairytale story of her own when she set sail across the Atlantic Ocean on the SS Bremen to start a new life in America, bringing with her a determination to share her love of the majestic beauty and romance of her beloved homeland…and this is exactly what she has accomplished. For years, I was curious about and wanted to visit this highly acclaimed chateau located in a remote area somewhere in the vicinity of Yosemite, and yet somehow just hadn’t made my way there. After once again seeing this Relais & Chateaux property awarded a Forbes Five Star Rating, AAA 5 Diamond award, and being listed as one of the top hotels in the United States on several industry lists, I decided I had to make it a priority to visit it in person. An unassuming turn off of Highway 41 brought me to the gated entrance of what would be the beginning of my fairytale story ~ for a weekend at least. Something magical happened from the moment I drove through the gilded gates and began to approach the chateau. I felt as though I was immediately transported back in time as I was greeted by a Houseman and Lady’s Maid in formal attire awaiting my arrival. It felt quite pampering and decadent. This property has a very personal feeling of visiting a family estate rather than staying at a hotel. You are welcomed and treated as though you are the most important guest in the house. The grounds are gorgeously manicured with colorful plantings and a natural landscape, scattered statuaries, and a pool. As you meander around the walkways and head towards the private villa, you will come across a whimsical area showcasing a pond and a gazebo along with some playful activities such as swings, a bocce ball court and a life-size chessboard. Mind you, none of this is by happenstance. 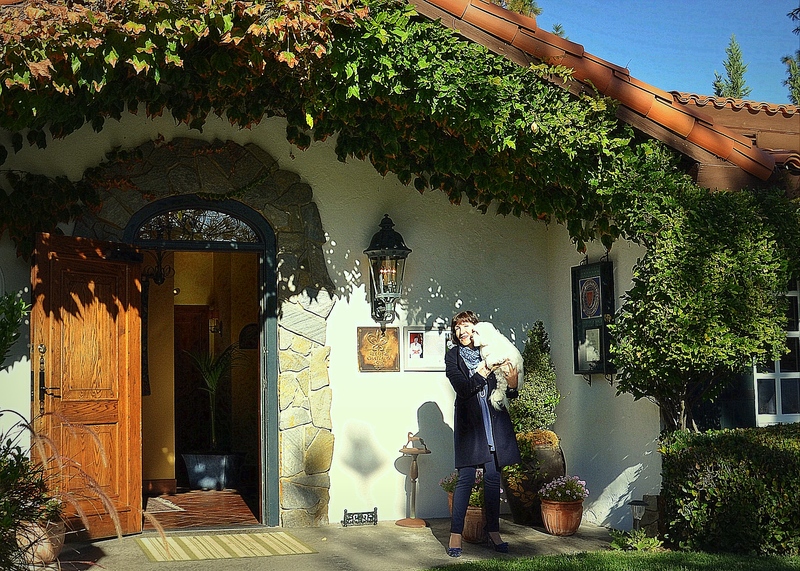 Every little detail of the entire estate has been carefully and meticulously designed and executed by Erna herself. In 1984, after running a restaurant in Yosemite Park for many years, Erna procured her current property and opened her fine-dining restaurant, Erna’s Elderberry House Restaurant. I had the distinct pleasure of hearing the story directly from Erna about how the restaurant was slowly making a name for itself; however because of its remote location, it wasn’t until a few years later after a visit from the acclaimed food critic, Craig Claiborne, and his amazing review of the restaurant that was published in the New York Times (see review here), that the restaurant was exposed nationally and became a sought-after destination. After years of successfully drawing a high-end clientele to the restaurant, Erna acknowledged the need to build accommodations to house the guests who were visiting this remote area. With sheer determination, Erna took it upon herself to design every aspect of her vision for a European chateau and hired builder, Gary Browns, to execute it ~ and in May 1991, Chateau du Sureau was born. Erna celebrated the opening in style with the guest list including the likes of Wolfgang Puck, Robert Mondavi, Anthony Hopkins and Barbra Streisand, just to name a few. Rumor has it that later Villa Sureau was built to accommodate some of the discerning guests who frequent the hotel. The main 9,000 sq. ft. chateau offers 10 guest rooms, a common living room, a kitchen with a dining room and the surprise element of a small chapel in keeping with European traditions. To say that Erna’s personal touch is everywhere would be an understatement – no detail has been left undone. Erna personally scoured local and European antique auction houses and has chosen each piece of furniture and accessory that adorns the estate. Many of the antiques have been shipped over from Europe creating the authenticity that would only be acceptable by Erna’s standards. And although the chateau is filled with beautiful antiques where you might think you would feel apprehensive about touching or sitting on anything, I found all the furnishings to be very sturdy and comfortable, creating a very inviting environment. Each of the ten guest rooms are uniquely designed and offer furnishings and distinctive touches that you might expect when staying at someone’s personal home. In keeping with Erna’s culinary connection, the rooms are all named after herbs such as Rosemary, Mint, and Chamomile. Many of the rooms are furnished with beautiful canopy beds, colorful tapestries, and dainty writing desks. I stayed in #7, the Saffron room, which had an authentic circa 1830’s Ebony wood with ivory inlay furniture set and a beautiful floor to ceiling tapestry. When I initially walked in the room, I was struck by the fresh scent of crisp, clean linens. Some freshly baked cookies were placed on the side table of the bed, that somehow just felt like a loving gesture. All the rooms have an excellent sound system that is hidden in and can be controlled from the armoire which filters lovely music throughout your room. WiFi is available in the rooms and throughout the property. The rooms do not have televisions but if you can’t live without one, the staff will gladly supply a small flat screen TV in the room for you…but really, take a break and just enjoy the beauty and serenity around you! Each room has an en-suite bathroom supplied with L’Occitane amenities and plush robes to wear. Although I did not see all the rooms, I was certainly enamored with the ones I did see. A few of my favorites were The Mint (#9) that has an exterior entrance off the back patio of the chateau and a beautiful canopy bed; and the room I stayed in, the Saffron (#7) because the room was spacious and had a nice view of the gardens on one side along with a small balcony that faces the sunset on the other side. However the next time I visit, I want to stay in the beautiful Elderberry room (see here for updated post on the Elderberry room) that faces out the front of the chateau as the room has a small balcony facing the beautiful redwoods and I want to sleep in the gorgeous canopy bed. There were so many charming touches that I found so enchanting such as shortly after my arrival, I was greeted by one of the lovely chambermaids who brought a wonderful tray of tea and finger foods; the keys to the room are actually a key, not a plastic card and each has a personal tassel attached that identifies your key when you place it in the box for the night service staff to freshen up your room while you are at dinner; the sweets placed upon the bed at night with a personal note ~ all such charming touches. I was told by a staff member that “Ms. Erna”, as she is affectionately called by the staff, oversees everything in the house first hand. I experienced this as there was a wedding being held at the property during my stay and Erna was directly in the midst of all the action, making sure every detail was being executed on point. It is quite obvious, that this is a labor of love for this woman ~ she puts her heart and soul completely into this endeavor. And it’s all very apparent in the meticulous cleanliness of the rooms, the fresh flowers placed throughout the chateau, the way the staff is presented and the excellent service they provide, the quality of the food and all of the small details that make a stay here so special. In speaking with Erna, she stated it’s not always easy but I get the feeling that if she couldn’t keep this up to her standard of excellence, then she would probably rather not do it at all because this is the only way she knows how to represent herself. As you have probably gathered by now, Erna’s love of culinary delights is a huge part of the experience here. In European style, the hotel offers a regular or full-board package that includes a full dining experience at Erna’s Elderberry House Restaurant. The dinner is an event in itself. In keeping with the personal touches, the menu is customized with your name. My dinner was almost a three hour affair, enjoying one delicious course after another. And although dinner would normally be held in the restaurant, I ate in the quaint chateau dining room due to the onsite wedding and had a lovely time conversing with another couple having dinner there as well. The menu is a pre-fixe menu each night but I found the chef to be quite flexible in making exceptions to the menu. The kitchen is more than willing to accommodate your needs and taste. I didn’t take advantage of it, but I was told that the chateau’s kitchen (separate from the restaurant) is open 24 hours and the staff will do their best to accommodate your request. A delightful breakfast is included each morning, and I am not joking when I say that I was awakened in the morning by the alluring aroma of homemade baked goods as they danced their way through the floorboards and enveloped my room arousing my senses. It was heavenly! I made my way downstairs and enjoyed my breakfast on the outdoor patio with tables set with colorful French linens. In general, a delightful egg dish is served each morning along with fresh fruits and a cereal bar. As a side note, if you find yourself in downtown Oakhurst, I ate lunch at the Southgate Brewery Company and it was delicious. They microbrew their own beer along with root beer as a non-alcoholic option and make some yummy homemade potato chips along with many other creative dishes. For the more discerning traveler that might appreciate a little more privacy and decadence, the Villa is a perfect choice. The Villa is 2,000 sq. ft. and consists of two bedrooms, and a common sitting area. It is beautifully decorated with a very decadent feel and the closest experience that I could ever imagine to feeling like royalty. It is my understanding that the Villa can be rented in its entirety or by the room, if available. A small gate and sign acknowledge that it’s the private Villa and it’s location in a wooded part of the property offers some privacy from other guests. Once you walk beyond the gate, the property opens up to the large, impressive structure along with a lawn area with a small pond and private hot tub. It’s all quite impressive and would be a lovely way to spend a honeymoon or special occasion! 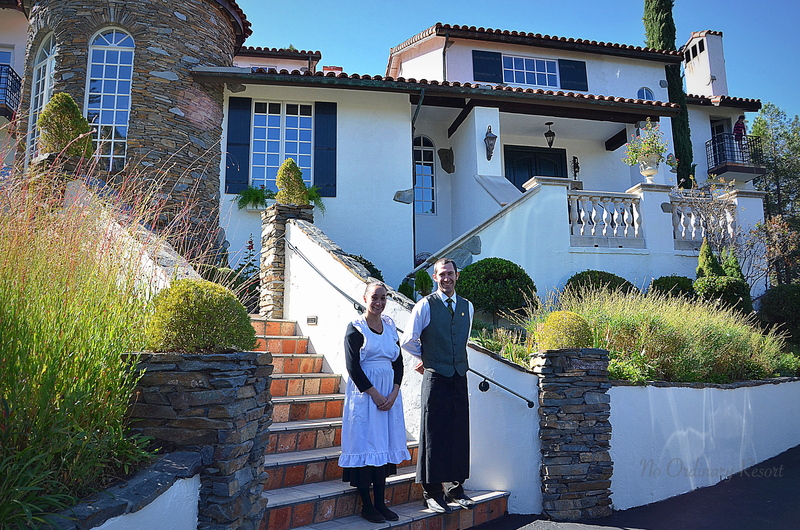 The most recent addition to the property is Spa du Sureau. I’ll be quite honest in saying that I would never have expected a spa at this small property and I was very impressed with the quality of it. As you enter this building, you step into a very serene and calming environment where you immediately start to feel your stress melt away. The staff is very professional, there is a sitting room, treatment rooms and a steam room. Just another way Erna has managed to provide a superior experience to her guests. It’s clear to me that Ms. Erna was meant to share the beauty of her world with all of us. This is a woman who clearly had a vision and knew exactly how she wanted to execute it. I find it impressive that Erna has managed to “brand” herself on this nine acre property in tying her restaurant, chateau, villa and spa together to provide a complete experience for the guest. I love the fact that she even created her own “crest” that is seen throughout the property located on the exterior of the chateau, on plates, on towels ~ it makes a strong statement. A little tidbit I learned, if you are not royalty, the armor in the crest must be tilted to the side. Another fact I learned during my visit is that the hotel closes down for a few weeks in January for maintenance ~ carpet cleaning, painting, repairs, etc. I found that to be quite impressive and I think it speaks volumes to the standard of quality of this owner and property. When I started this online magazine this is exactly the type of property I was hoping to share with my readers ~ a luxurious, unique and distinctive property, that exceeds the guests’ expectations and offers a complete sensory experience. One little thing….shhh…nobody tell Erna that this perfect, little fantasy world she has created in the forest of Yosemite can possibly be real. Let’s just ride it out with her as long as we can ~ nothing wrong with escaping reality from time to time! Well done, Ms. Erna, well done! Wow – I would have thought I was reading about a European luxury getaway, Miss Erna has done an amazing job. You are very blessed to get to experience these wonderful places and we are super blessed you “share” them. Yes, it’s lovely and you would have a blast taking pictures in Yosemite. Spring is the best time!